Michael Chaffee, writer, poet, novel, author, philosophy, poem | Challenging the perceptions for our realities! Each and every one of us has a purpose. 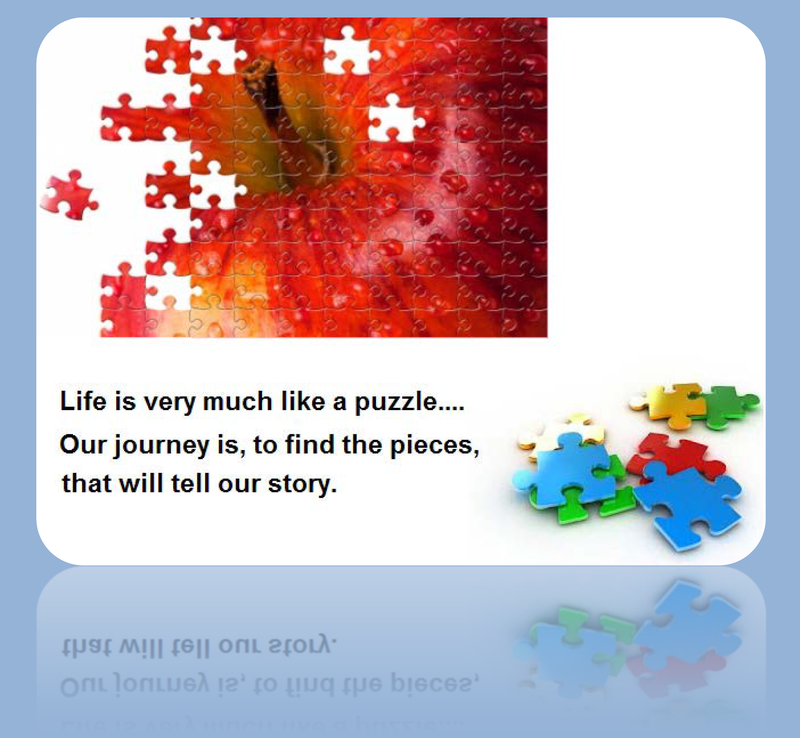 Finding our purpose is very much like organizing the pieces of a puzzle. When our individual purpose is discovered, we can then begin to fit life’s pieces into the bigger picture, which may offer us greater focus for the uniqueness that resides in our individual soul’s character. This is where our responses to life’s circumstances may add or detract from the hues and tones of color that can emanate from our souls. Having a clearer understanding for the bigger picture can aid our efforts at piecing together the puzzle, and this can help us to start with framing in the edges. This is where the edges of each one of the designed pieces can become recognized and distinguished for where and how they will fit and fall into place, by design! The bigger picture is to become a loving example to the best of our ability and begin to apply the authoritative prescription of God’s love from which we were made. For many of us simply trying to read a language, such as Latin in which life’s prescribe scholarly meaning has been ascribed, is undecipherable. As such, it can become untranslatable for the purpose of obtaining a greater meaning for life’s responsibilities and discovering what our greatest purpose may be? The challenge is to seek out and connect with the power of light that resides in the universe and ultimately in you! This light can illuminate our path and much like solar voltaic cells being powered the light can charge our batteries with the energy that comes from this light. The quest of discovering one’s “truest” self should be the single most important accomplishment that we engage during our lifetime, why? Quite simply,…because each of us are here to discover the heart of our soul. In thousands of different ways and in thousands of challenges, we are afforded the opportunity in life to gather the pieces that can best represent our uniqueness during the span of our lifetime. For it is only from this effort that meaningful understanding for our life can begin to form a recognizable image from the many disheveled pieces in life’s puzzle piece choices. The puzzle pieces that form our overall appearance are all individualized, yet they must all collaborate in the formulation of presenting us as a recognizable soulful imagery to a likeness of God’s creation for mankind. That journey must begin deep within each and every one of us, for in understanding ourselves we can become better understood via the introduction to our souls! What emanates on the whisper of thin air is intelligible and it is communicated on the sub-level of our adaptive consciousness. In the gift of human awareness, we are afforded the ability to reason and refocus a dutiful attention to the key importance of self representation, not as though but at the cellular level. Our physical senses are connected to our soul’s consciousness and scientist have proven that this does truly take place! Research has measured our intuitiveness, and although without taking orders form the consciously aware command center of our minds, our bodies measurably react to the mainframe of the soul’s “zettabyte” processor. This access is appropriated when our exposure to challenging environments invite the participation of our intuitiveness. This is where our souls partake in the decision process for the pieces of the puzzle we want to authentically represent ourselves. In seeking discovery of one’s “truest” self and attempting to fulfill the obligation of representing our best example of self, we can begin to repay the blessing of having received a chance at life by tuning to the power we possess, the mainframe of our soul! The repayment is made in cosmic currency and this is measured in bestowing the shekels of unconditional loving intentions upon others and learning to also love thy self. As the light of the universe is invited into our hearts it recharges our soul’s batteries and will allow us to shine a brighter light upon the path for others, as well as ourselves! Some other souls may also be stumbling in the darkness while searching for the discovery of themselves and the ultimate discovery of God’s infinite love. In seeking out the power of the universe, we become empowered! In doing so,…all the pieces to our personal puzzles will begin to fit into their correct alignments, as mathematicians can validate in calculating the ratio of chance. They will take form and they will allow the clearest image to evolve for who you are by reflecting in the mirrored example of who resides in your soul’s character. This is not just the reflection of the desires of the heart in your earthly character of wants and desires but, the you that God knows you are when he was counting the hairs on your head in the womb. We are not our education, we are not our professions, we are not something outside ourselves, we are all human-beings that have come from the image likeness of God. That likeness is love and was placed within the heart of our souls! Our best is locked inside ourselves and we must find the keys and unshackle the chains that bind our greatest potential. We are all “gold medalist” who have swam the torrent seas in the struggle for life and we have all won the opportunity to show God that we get it! We need to display that accomplishment proudly and recognize the equality that exist in all those around us! Each has obtain a special savant, each has an contribution, and each has a need to give and take meaning from this life that we all share. In affording each recognition of their savant, we will be nourished with the replenishment’s that feeds our souls and be rewarded with the gift of greater enlightenment. If one does this without trepidation and without any form of expectation of reciprocation for what may come in representing our truest and most authentic self well then, this shall be the first step upon the path to finding your way back home. In learning how to share in our greatest gift from God (which is to love unconditionally) we are exemplifying the likeness in God’s image from which we were modeled after! In them, through them, and with them…we will come to discovery the meaning for why we all swam so hard to get here and are together on one beautiful planet called Earth! My philosophy in life is to seek out greater understanding by peering through the opaqueness that obscures my view, and in doing so allow such introspective observations to help me to frame in the edges of my own puzzled soul. This is the journey,…and although life’s destination is unknown until we arrive, I enjoy attempting to work on myself in a hope that I can learn to truly love unconditionally.